An alert tab shows employment and job title changes of contacts. One touch allows you to log email as an activity. Find and return information on contacts selected within Word documents. Information appears in a pane to the right of the screen where CRM tasks can be performed; e.g., add/view activities, review relationship info, add/remove from list. 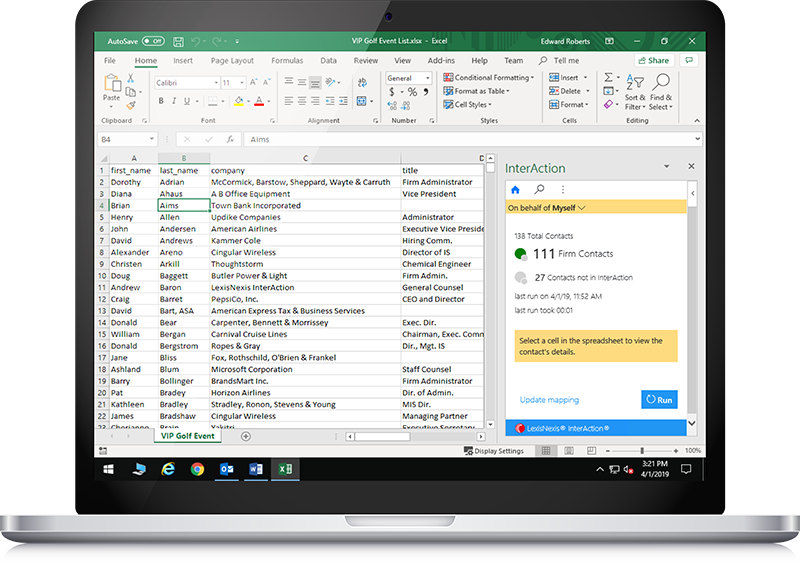 Integrate InterAction CRM data with data in Excel spreadsheets, with contact information appearing in a pane to the right of the screen. Make a VoIP call directly from the InterAction for Office 365 and record it as an activity. 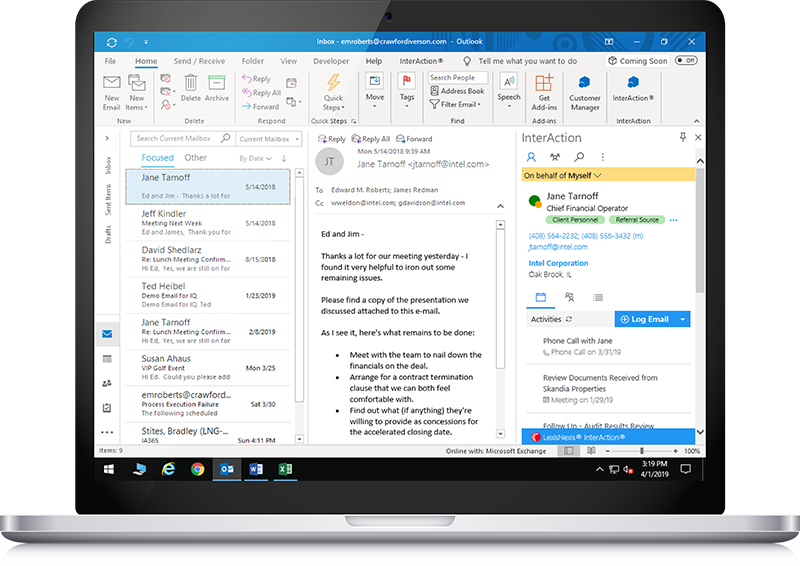 Includes the convenient option to enable “automatically create email” or “automatically create phone call” activity for a contact. We Listened. 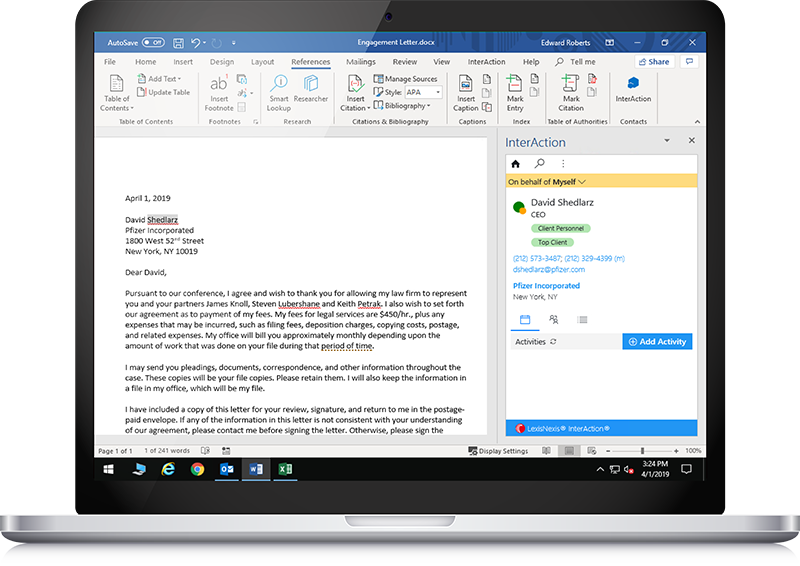 Your Feedback Helped Us Develop InterAction for Office 365! redesigned pane that shows high-level contact data and key information across three tabs: Activities, Relationships, and Lists. Contacts One click to identify if an email sender (plus anyone in CC) is an InterAction contact, and display relevant contact information. Two clicks to add any contact not in CRM to your InterAction database. Alerts Alerts shown under a single Activities tab include employment change and job title change. Activities Past and future activities are displayed in a single, easy-to-read pane with a blue dot indicating future activities and appointments. Past activities displayed include attended events, RSVPs, phone calls, and meetings. Log an email as an activity with just one touch. Relationships Reveals co-workers who know a selected contact as a way to facilitate an introduction from a colleague. Lists Displays both marketing (with and without sponsorship) or working lists in just one click. You can sponsor, un-sponsor, and remove a contact from a list.